THE local Darkness into Light walk was launched last week in IT Carlow. The walk, which is symbolic of the journey from despair to hope, begins in darkness at 4.15am on Saturday 11 May. 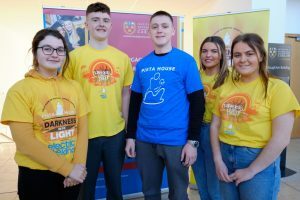 Hundreds of people from Carlow and the surrounding areas will walk a five-kilometre route around Carlow town, starting out in the darkness and walking into the light of dawn. Students from IT Carlow have volunteered to support it this year. This will be the sixth time the event is taking place in Carlow town and over the last five years more than €180,000 has been raised for Pieta House. Funds raised help to keep Pieta House’s counselling services free of charge and freely accessible to those in suicidal crisis, people who engage in self-harm and those bereaved by suicide. Since opening its doors 13 years ago, Pieta House has supported more than 40,000 people. Walkers can register online at www.darknessintolight.ie. By walking from darkness into light, everyone can play a part in removing the stigma around suicide and self-harm while spreading the power of hope.